6 :: Gerrards Cross Golf Club is considered one of the most attractive courses in South Buckinghamshire. Kindly sponsored by MUSTARD PR. 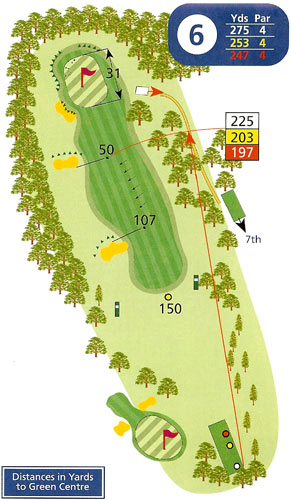 This short par 4 is guarded short right of the green by a large tree and the perfect tee-shot will be hit slightly left of this. Long hitters, aided by the gentle downhill run-in from the right may well drive the green but a dying ball will often be gathered by the greenside bunker on the left.